The second day of Sweet Sixteen action brought us very little surprises in the top-heavy side of the bracket. Villanova, Kansas and Duke all advanced to the Elite Eight as expected, while Texas Tech made history with their first ever Sweet 16 win. #5 West Virginia 78 #1 Villanova 90: The Wildcats establish themselves as the favorites to win it all with an impressive win against the Mountaineers, led by Jalen Brunson (27 points) and an onslaught of threes, hitting 54.2% of them. That made the difference – WVU couldn’t convert from deep, and Jevon Carter was held to 5-for-16 from the field and 12 points. #5 Clemson 76 #1 Kansas 80: The Jayhawks dominated early, giving themselves a comfortable cushion lead to lean on for the rest of the game. Malik Newman was once again the go to guy with 17 points (four 3-pointers), not letting another big game from Gabe DeVoe (31 points) stand in the way of a third consecutive Elite Eight appearance. 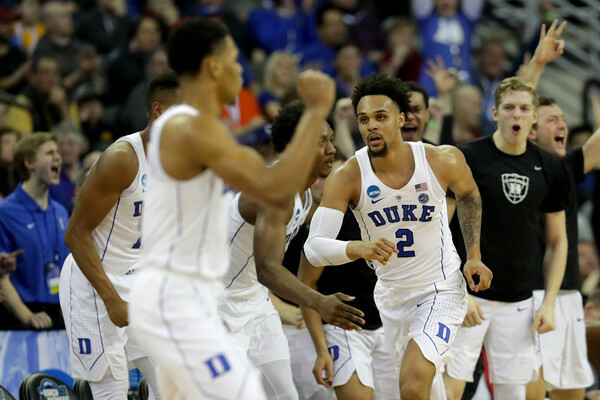 #11 Syracuse 65 #2 Duke 69: The first Elite Eight since 2015 (when they went all the way) for Duke, thanks to terrific offensive rebounding (16 overall, 6 for Marvin Bagley) and forcing 16 turnovers off of the Orange. Syracuse did hold Duke to 39% from the field, but Bagley still got his 22 points, aided by Grayson Allen with 15, although he shot 3-for-14 from beyond the arc. #3 Texas Tech 78 #2 Purdue 65: The only sorta upset of the day, as the Red Raiders make the Elite Eight for the first time in program history after 5 failed tries. Turnovers (17-11) and clinical shooting from the line (17-for-18 by TTU) made the difference, while Keenan Evans topped Tech’s scorers with 16. Carsen Edwards poured 30 points for Purdue, which wasn’t enough.